Alone. Seemingly abandoned, but unafraid. The figure stands as if casually waiting for someone who is just out of view in the distance. It speaks to our ultimate aloneness in the world. After all, there is no other person, other than ourselves, with whom we will travel through our entire lives with. Yet there is a strength, self-reliance and peace in her aloneness. 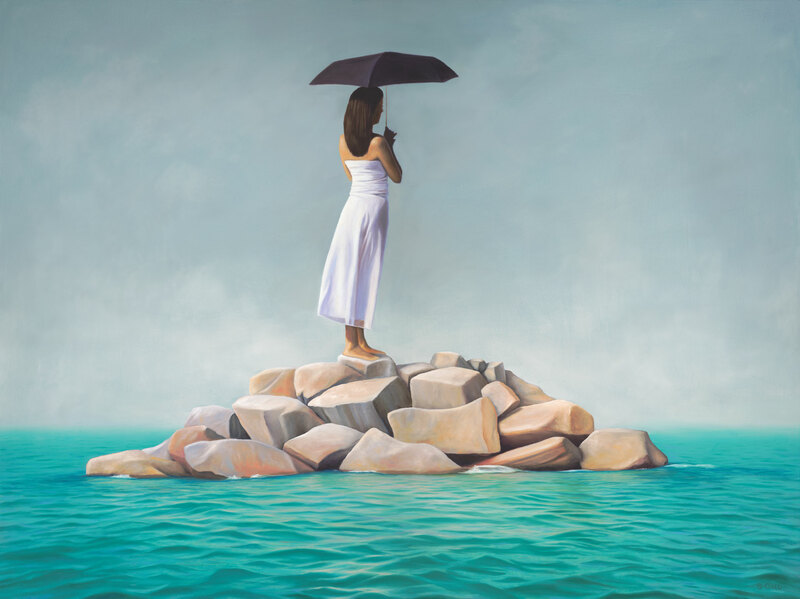 On the most personal level, this painting represents my wife as I imagined her waiting for me to arrive in her life. Prior to our meeting, we had both spent time alone and worked to consciously clear our old “baggage” – hence, no luggage on the island – so that we’d be prepared for the highest level of relationship possible when we met.